I’m crying. I am bawling – practically unable to speak. My husband got emotional too. This was so kind – so incredibly kind and thoughtful and beautiful. I don’t have a really important job by societies standards, right? I’m not a doctor or a police woman. I don’t save lives. There are days where I feel like I’m not really doing my part in this world. I eventually talk myself down and pretend that my honesty about my life and parenting might help someone out there every once in a while. I just got this letter from a reader. She sent it to my PO box along with a care package of religious items to let me know that my struggles with this pregnancy is helping her get through a family issue she is dealing with. She also wanted to let me know that she is praying for my family as we round out this current test. This is not something that happens often. 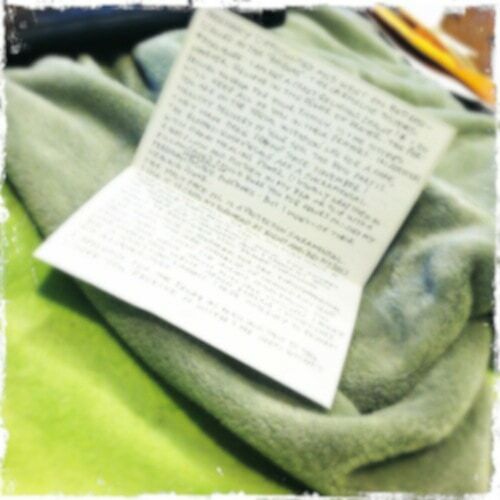 But let me tell you – I will NEVER forget this letter or this woman. I am BAWLING. It literally took me a good 10 minutes to read the letter because I was dry heaving from the emotion. As someone who puts it all out there, I cannot thank Deborah enough for sending me this care package. I will use everything that you provided and I will never forget the kind gesture that you have done for me. It was a true gift. You don’t realize how impactful a small act of kindness can be. I will most certainly pay it forward. Now if you will excuse me, I have to continue dry heaving in a corner until all the emotions are leveled out. This was so beautiful. You are such a wonderful soul, Vera, that a reader sending you such a thoughtful letter and gift doesn’t surprise me. We all love you and are rooting for you. You’re in the home stretch! In the news biz we used to say for every viewer who bothered to call to tell us something there were 200 times as many thinking it but not taking action… I believe that to be true here, too…you touch so many lives each day without realizing it. I’m glad this gal let you know it…hugs my friend! I’m so glad you received something nice on the mail like a good letter from a fan! I hope it helps you remain positive as you get to the end of your pregnancy. What a nice jester! I am crying too! TY for sharing, perhaps now you & Debrah have taught the most powerful message of all. Giving back, & thanks openly can change lives. I also think the realization of the connections you make through social media shows how important you are. That’s really sweet. I think we all have moments when we think we’re not making any sort of dent in the world, but then something like this happens and you really realize just how important you are to someone. I think people in general are always very quick to point out when someone messes up, but don’t really think to praise when someone has done well. I love to write emails or call managers when I’ve experienced or witnessed one of their employees doing something nice or going out of their way to be helpful. You just never know how your one little gesture could make someone’s day. I’m so happy that you received that nice letter and care package. You really do make a difference to all of your readers and deserve every nice gift, gesture, good thought that comes your way!